What makes SEBO vacuums among the best rated in the world for removing pet hair from your carpets? At least that is what the company claims and is a major part of their marketing campaign. But is it true? How do they compare to other brands of similar price and options? First let’s take a look at the company and where they got their start. 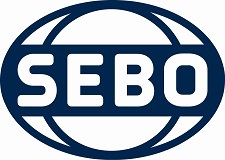 SEBO is a German company that was founded in 1978 with roots in the commercial cleaning industry. Professionals who clean hotels, hospitals, schools, and office buildings were among their first customers and really pushed the brand to new heights of popularity. Their customer reviews were very positive and their sales really took off. This is important as it shows that from the beginning they were focused heavily on quality, both in construction and ability to remove dirt from all types of floors. Eventually this would carry over into their residential cleaners. During the mid 1990’s they ramped up their residential vacuum lineup. Right away it was evident that they weren’t your average cleaner, as the filtration was quite advanced and they were built to last for more than 10 years. This is largely due to the experience they had in the commercial industry where the machines are used daily for hours at a time. Once they applied the same construction methods to their household vacuums the result was a very high quality brand that could compete with the major companies. The collection bag is built of three or four layers, designed to trap and hold pretty much all of the dirt pulled into the vacuum cleaner. When combined with the various filters that trap the microscopic organisms like dust mites and mold spores, the air that is pushed out is much healthier than what goes in. In fact, their filtration system is rated to remove more than 99% of these allergens so they are great choices for any family with allergies. The bags seal up completely tight upon removal so nothing can escape out onto your skin or clothes. This is a very important quality and one that most bagless brands cannot boast about. The filters on bagless vacuums also clog much quicker since their is no tight seal inside the air path. A lot of the dust actually ends up on the microfilters instead of the bin. Even though SEBO’s vacuum cleaners really shine on carpets they are fully capable of cleaning hard floors like tile, linoleum, and hardwood. The ability to turn off the brushroll on their uprights lets you use it almost like a powered broom. Plus, you get a huge list of attachments to choose from for each model. Some of their more popular ones include their wall and floor brush, parquet brush, turbo handheld brush, and for their canister lineup the various power head attachments. Any modern cleaner needs to be versatile enough for all flooring types, since the modern household is no longer predominantly carpet. The SEBO X4 is a full sized upright vacuum with commercial grade construction and HEPA filters to remove virtually all dirt from high piled carpets. This model is designed to last for between 10 to 15 years which ends up saving you money in the long run. Plus, it is one of the top choices for families with pets as it is purpose built for eliminating hair and dander from all surfaces. One of the most unique qualities is the automatic height adjustment. 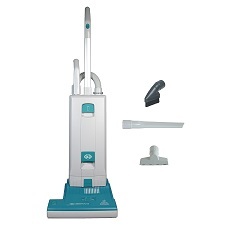 This lets you pass over various types of flooring without the need to make any adjustments to the vacuum. It will do all the work for you as it automatically raises and lowers the head as you pass over carpet, then hard floors, then back to carpet. Most vacuums have a manual adjustment (if any at all), but the X4 makes this process an afterthought. Other main features include a quick change bag system so you can quickly change bags when full, an extending wand and hose for those hard to reach spaces, and high tech air flow design to forcefully funnel the air directly into the bag so nothing can escape along the way. This keeps the filters free from clogging, and the suction power constant. Click here to browse our detailed review for specifications and a short video that demonstrates why it’s such a great choice for any household. 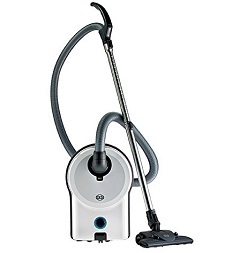 If you’re looking for a great pet vacuum, then the SEBO FELIX is one of the best choices you can find today. It’s a full sized upright that can quickly convert to a portable canister, without losing the suction power or quality filtration that really sets it apart. One of the first things you will notice when using it is the swivel neck design, which gives you 180 degrees of maneuverability with the flick of your wrist. This solves the age old design problem of larger uprights…they can be cumbersome to use unless the area is wide open. SEBO solves this with a unique approach, by slightly changing the design for the better. You really need to try it once to understand how great it works. Various attachments help you clean a variety of surfaces and their S-Class microfilters virtually eliminate all of the allergens from the air. You will breathe much easier once you bring the FELIX into your home. Click here for our in-depth review to see if it’s right for your family. The AIRBELT D lineup consists of 3 different full sized canister vacuums that are built for larger households with a variety of floor types. Depending on whether you have mostly smooth floors, mostly carpets, or a combination of the two you can choose the right configuration. The attachments are full sized which is quite a bit larger than most brands, giving you more coverage so you spend less time cleaning. As with all of their machines you also get fully sealed, commercial grade HEPA filtration that can trap virtually all microscopic dust so it cannot escape back into your home. And the soft foam bumper that goes around the body will protect your items from any scuffs or scrapes should contact happen during use. The soft rubber wheels were also designed to not leave any marks while rolling over the surface. A huge selection of accessories is also available for such items as curtains, corners, bedding, and more. The AIRBELT D provides a lot of cleaning ability for the price. To compare the 3 different models, click here for our review and a quick video demonstrating how the power head works. The Essential G1 and G2 are built to commercial grade specifications with heavy duty internal components and the high quality filtration that SEBO is known for. The comes with a 12 inch wide power head while the G2 has a 15 inch, but the rest of the machines are the same. The choice really comes down to the size of your home and amount of carpeting. One unique feature is their instant use wand and suction hose which are both ready to go as soon as you pull them out. They can be used separately or together to clean those hard to reach places like corners, crevices, and curtains. When used in tandem you get an 8 foot reach, and either can be used with any of their many attachments (some available at an extra cost). Overall it is one of their best uprights you can buy today. To learn more about it to see if it makes sense for your home, click here to read our review and model comparison.